I’m not sure if I cooked it correctly… again, I am the worst at this. And it’s instant ramen, someone please send me a chef to cook me samyang. The instruction says to drain the noodles until there are only about 8 spoons of water left (teaspoons? Tablespoons? Didn’t say). And then pour the sauce into the pan and stir fry the noodles with it for 30 seconds (I sure hope it wasn’t “minutes” because if that was the case then I screwed up horribly). Then it came out like this…. Why so soupy? I swear I left eight spoons (or something like that.. I wasn’t sure which spoon they meant) of water left… but it does not look like the picture ontje package. Dear Samyang, please send someone to teach me how to do this. 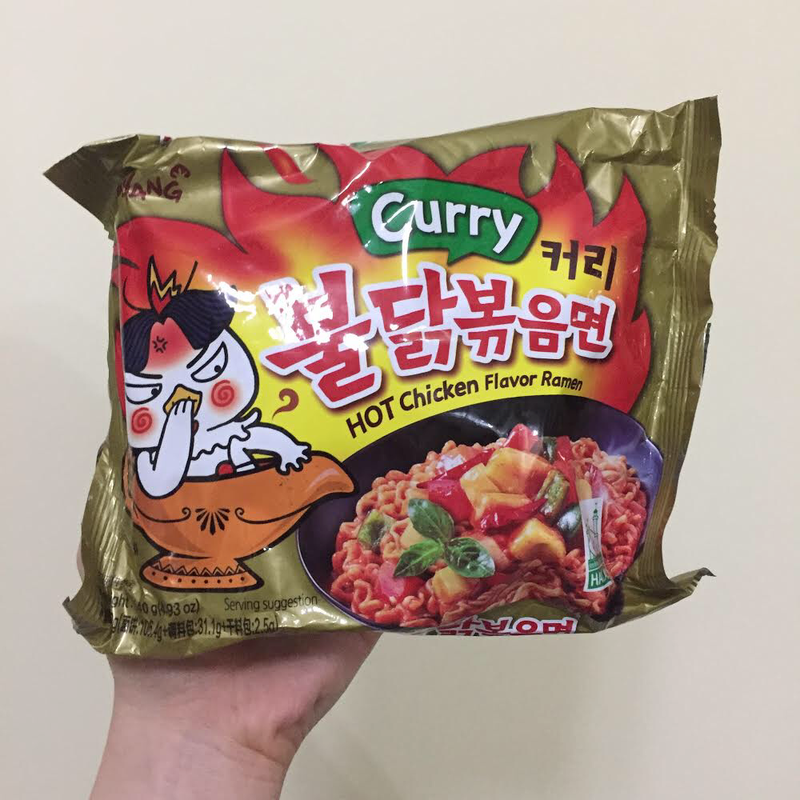 It tasted just like the regular Samyang, and my lips went Kylie for like an hour or so. It just smelled ridiculously good. The Curry spices, the warmth, and the heat from Samyang just worked so well together that I couldn’t complain that it tasted just like the other Samyang. 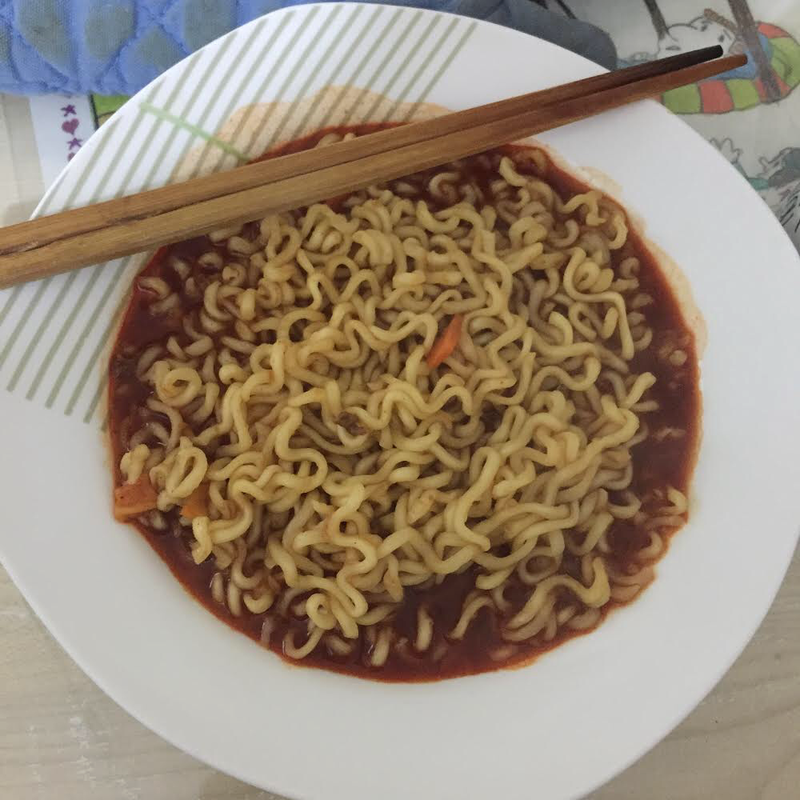 When regular Samyang was always a snack to me, this one felt like comfort food. I wouldn’t recommend it to people who can’t even take the regular Samyang, but to those who love Samyang, then go for it. I’m so glad I got another one. Hahaha. So I can try to cook it “correctly” next time.